As most of you know, this past weekend was Memorial Day Weekend. You probably know this because, instead of going to work on Monday, you spent the day paying homage to our American heroes and celebrating the beginning of summer by eating juicy burgers, drinking cold beer, and slurping ice cream at various picnics and backyard barbecues. A pretty wonderful holiday, in my opinion. This year, my family decided to take a trip to Charleston, South Carolina, for the long weekend, where we skipped the traditional Memorial Day fare of burgers and dogs and focused mainly on pulled pork. And coleslaw. And lemon icebox pie. We ate all this at Jim and Nick’s, and if you’re ever in Charleston, I highly recommend a trip. You could also take tours of the old Plantations and the famous Fort Sumter (the site of the start of the Civil War), if you’re so inclined. We did most of that, but when push comes to shove, my family is less historically inclined and more gastronomically inclined (really, can you blame us? Just look at that pie, for goodness sake). Basically, our trip to Charleston consisted of a few horse-drawn carriage tours and way too much food. As it happens, we were sampling some (more) local cuisine one day at lunch, and I noticed that one of the salads on the menu boasted “chic peas” as an ingredient. This intrigued me greatly. I have never heard of chic peas, but they certainly sound like a very elegant and stylish pea, don’t you think? Anyway, I was pleased to hear my mother order the salad featuring chic peas, and was itching with anticipation to learn the identity of such a fashionably named legume. Lo and behold, my mother’s salad was brought to the table, and I finally learned that a chic pea is… actually just a misspelling of the word “chick pea.” Garbanzo bean. What a letdown. At any rate, my sister and I shared a good laugh over the orthographical error of the chic pea, and when I got back to New York yesterday and found scant little in my pantry, I decided to open a can of my very own chic peas as inspiration for a quick, thrown-together-from-the-pantry dinner. Not quite as good as Charleston barbecue, but chic enough for me. This is a take on traditional bread salad, or panzanella, which usually incorporates day-old bread scraps, tomatoes and olive oil. I use crumbled pita chips instead of stale bread, and I pair it with a mix of bright Mediterranean flavors, including tomatoes, olives, chick (chic) peas, cucumbers, and lemon juice. For a thrown-together, no-cooking involved dinner, it’s pretty darn satisfying. I ate the salad as a stand-alone meal, but it would be delicious served alongside some grilled chicken or fish for a more robust lunch or dinner. Keep in mind, this is more recipe guide than actual recipe – I guessed on most of the measurements, and the ingredients themselves are merely suggestions. Feel free to add or subtract certain veggies, or, for extra chic-ness, throw in a handful of feta cheese… you little salad stylista, you. 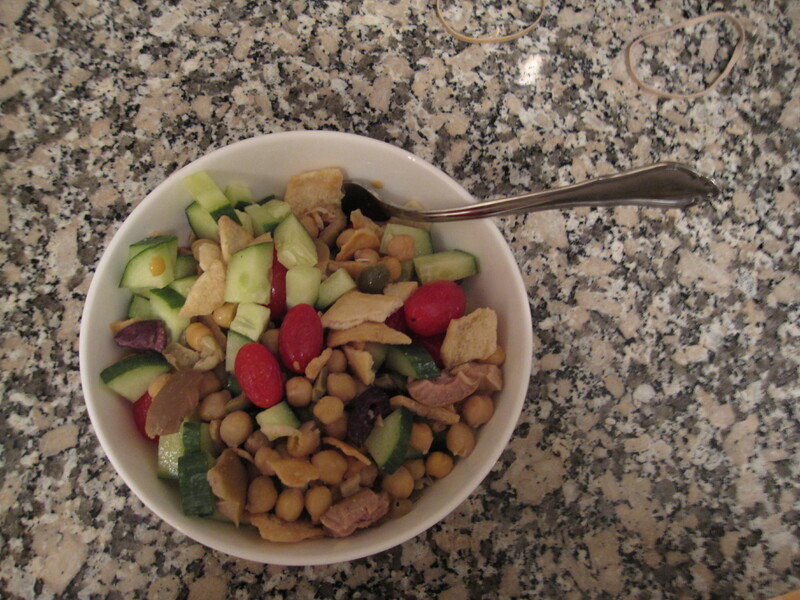 Mix together the chick peas, tomatoes, cucumber, olives, and pita chips in a bowl. Sprinkle with salt and pepper, and drizzle with olive oil, lemon juice, and balsamic. Mix until incorporated, and serve immediately if you want the pita to stay crunchy. Serves 1 for lunch or dinner, 2 if eaten as a side dish. So, about that lemon icebox pie, was that among the best foods every created? And do you think that you could make one?